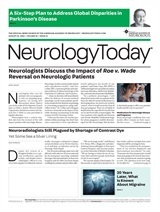 In last month's Neurology Today, several experts suggested that physicians who are not yet ready to purchase a full electronic medical record, consider buying just a piece of the package. One of the more popular so-called “point solutions” – electronic prescribing – uses computing devices to enter, modify, review, and communicate drug prescriptions, and is considered by many to be more efficient, secure, and reliable and less error-prone than its manual counterpart. Most experts agree that decision-making errors – including those related to prescribing – usually result from not having the right information at the right time. Daniel Z. Sands, MD, MPH, Assistant Professor of Medicine at Harvard Medical School in Boston, MA, and the recipient of several awards for advancing electronic communication with patients, would like to see clinical care transformed from an inefficient, error-prone, paper-based system to an electronic system that offers clinical support at the point of care. In fact, according to the Center for Information Technology Leadership, more than 8.8 million adverse drug events occur each year in ambulatory care, of which more than 3 million are preventable. According to the Institute of Medicine, medication errors account for 1 out of 131 ambulatory care deaths. How do neurologists fare? According to the 2004 Physicians Insurers Association of America Neurology Claims Study, which examined neurologists' skyrocketing malpractice claims, approximately one-third of alleged injuries in physician offices resulted from medication errors – including wrong prescriptions, over-prescription, medications that were contraindicated with those that the patient was already taking, or medications that were abruptly discontinued. “The value of true e-prescribing is that it is very difficult to make a mistake,” said Daniel B. Hier, MD, Professor of Neurology at the University of Illinois in Chicago. Like many neurologists, Dr. Hier uses ePocrates, an electronic decision support tool for prescribing. He also uses Cerner's electronic medical record PowerChart, which includes a built-in prescribing module for in-patient order entry. For his office electronic prescribing, he has created a “poor man's” solution in the form of a prescription template built into his chart note. It is self-documenting and allows for quick refills. Dr. Hier refers to the online version of ePocrates to ensure accuracy of office prescriptions. “Not a day goes by when I do not refer to the drug-drug interaction feature on ePocrates,” said Neil L. Pugach, MD, a headache specialist in Chesapeake, VA. “When a patient is on multiple headache medications and takes five or six additional medications for other conditions, the MultiCheck feature helps me make sure that there are no unsafe combinations,” he explained. “It also includes alternative medications so I can see, for example, if a patient's herbal preparation is safe to take with a triptan.” Dr. Pugach also uses the program to look up prescribing contraindications and to check for common side effects of medications. Paulo Andre, MD, a general neurologist, is the first physician of an eight-member practice in Framingham, MA, to try an electronic prescribing system for Tufts and Blue Cross providers in his area. He writes prescriptions for his office patients by accessing the Web version of PocketScript and operates a Blackberry handheld device to transmit prescriptions for his hospital and MS clinic patients. Dr. Hier, who serves on the University of Illinois Hospital EMR Committee, said it is crucial to the economic survival of practices to minimize unreimbursed physician time. He noted that pharmacy callbacks can be an extraordinary drain on physician time, and that they generally result from three causes: drug interactions, illegible handwriting, or a prescription not covered in the insurer's formulary. In fact, studies have suggested that a chart-pull alone costs between $4 and $6. The neurologists interviewed for this article all cited ease of refills as a major advantage over manual prescribing. “Refills can be done with one click, saving considerable time, and formulary information is readily visible so there are less callbacks from pharmacies,” Dr. Andre said. David A. Stein, MD, a neurologist in solo practice in San Diego, CA, has been using a computerized prescription program for over three years. He generates his prescriptions using his PC by accessing HealthRamp's Web site and creates copies for the chart. “The biggest advantage is that the program automatically defaults to the correct dispensing instructions and creates a nice printed Rx,” he said. Dr. Stein refers to an electronic PDR to ensure prescribing accuracy and creates a medication list in which he pastes pictures of the medications into an MS Word chart he creates for his epilepsy patients. Mikhail Mirer, MD, a child neurologist who practices in West Islip, NY, also uses HealthRamp – on his Tungsten C handheld device through a WiFi connection while in the office, on his Treo 600 palm-phone while away, and online – wherever he has high-speed Internet access. He believes that it provides enhanced customer service to his patients. The search engine quickly locates pharmacies by zip code, town, street, state, name, telephone, or fax number. Although a pharmaceutical company initially sponsored his subscription, he intends to renew it and pay $39.99 per month himself in the near future. One issue that often concerns physicians who are considering adopting new technology is security. Dr. Andre believes that electronic prescribing actually offers enhanced security benefits. He cited this example. A pharmacist called him recently when a patient tried to fill a paper script bearing his signature. The pharmacist, aware that Dr. Andre's orders only come by fax through the system's server, was immediately alerted. It was ultimately discovered that the patient had stolen a prescription pad last year and had been falsifying scripts since then. The forgeries were caught only after Dr. Andre began using electronic prescribing.